Photo by Steve Bauer/StateCollege.com Susan Wise and her son Jeff show off custom-made mittens from Second Season. Members of a Ferguson Township family are making a name for themselves for their creative "handiwork." 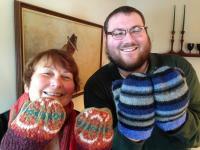 Susan and Scott Wise, along with their son Jeff, are hands down, the busiest mitten makers in State College. Their company is called "Second Season," a name that fits because they make their mittens out of recycled wool sweaters. But these are not just any old mittens. They're eye-catching works of art and no two are alike. And with fleece linings, they're designed to ward of the winter chill. Susan says she's been making mittens for about five years. She actually started out selling jewelry, but noticed another vendor selling mittens hand over fist. That woman asked Susan if she was interested in buying her business. Susan was reluctant at first. But she ended up buying the patterns along with the necessary know-how. Equipped with a bunch of trade secrets, Susan began making mittens herself. Susan definitely did not have great expectations when she started out, "I thought, 'Oh well, if I'm lucky I'll sell ten.' And everything just blossomed and boomed. Actually, it almost exploded on me. I could barely keep up with demand." News reports helped generate even more interests. Susan was selling her mittens in stores and began making appearances at craft shows. The mittens come in extra large (for men), large (for women with long fingers), average (medium - the most popular size) or small (for a woman with small hands or a child) and infant (six to 18 months). Some people like them so much they use the mittens as decorations. 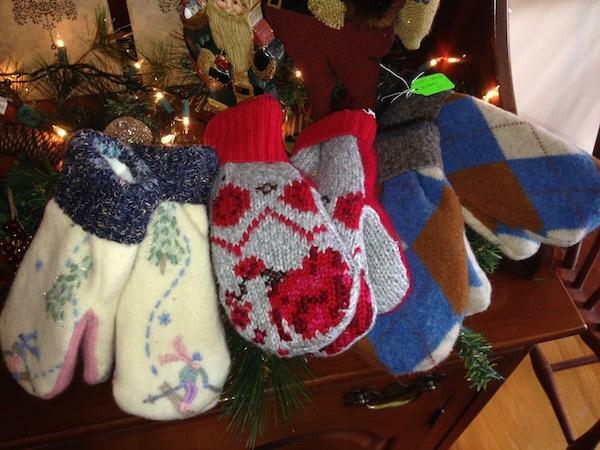 Susan says, "I had one lady bought a pair ... took the mittens and stuffed them with tissue paper and had them looking like someone had just dropped off their mittens." The process is more complicated than you might think. In fact, there are tricks of the trade that Susan won't reveal. What she will say is that, "We have to cut them. We have to make the insides, the outsides, the cuff, and machine wash and dry them. They're all wool and wool blends because I shrink everything." Jeff is quick to point out, "Each one is one of a kind. Nothing repeats." They use parts of two or three sweaters to make each set of mittens and it's impossible to make duplicates. The Wise's proudly state that all of their mittens are handmade. Jeff in charge of the business end. He handles the website and marketing. Susan is the creative force. She's responsible for the sewing. Her husband Scott is in charge of finding colorful used sweaters that will make great mittens. He's frequently on the prowl at area thrift stores, looking for new material. Scott also cuts up the sweaters and does the washing and drying. "Keeps me busy," he says. The family wants to keep prices reasonable. Jeff says, "It took awhile to make a profit," not because the mittens weren't selling, but because they were being sold too cheap -- for just a few dollars. Now, prices range from $15 for infant mittens to $35 for mittens made out of heavyweight wool. Susan says customer feedback is very positive. "A lot of people have emailed me saying 'I love these. These are just the best things, I can't find them anywhere else.'" Susan says she wanted a creative outlet -- a hobby. But it's quickly turned into a business that keeps everyone busy. The family is doing about 40 craft shows each year which is time consuming. Keeping up with demand is getting tough. Susan doesn't have an exact number, but says they're selling thousands of mittens every year. Some close friends and family members help keep the operation running and the Wise family says they couldn't make it all happen without those helping hands. It's not a full-time gig yet. Susan still teaches part-time at South Hills Business School. Scott is retired, after a long career in human resources. Jeff, however, is working in the business full-time. What Susan calls "Memory Mitts" are becoming a big thing. People bring her keepsake sweaters and she turns those items into brand new mittens that are pre-filled with sentimental memories. Those sweaters might come from someone's childhood collection, a beloved relative or perhaps someone who's passed away. "It means something, it's special," says Susan. One woman brought in eight sweaters so she could have mittens for her children, nieces and nephews. Another, brought in her mother's wool cape and had nine pair of mittens made. Susan says, "These warmed your heart, now let them warm your hands." Those memories can be powerful. Jeff says, "A lot of people have come in to pick them up; it gets to be an emotional thing." "It's very emotional," chimes in his mother. The Wise's may expand their product line in the near future. Susan says, "People come to me and say 'I've purchased all of your mittens, what else do you have?'" 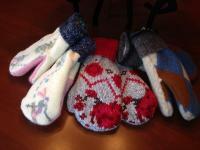 As a result, the Wise's are talking about making socks and slippers from recycled sweaters. Because they recycle sweaters, the Wise's are always looking for new sources. Jeff says, "If people are going to throw them out or have no use for them anymore, we try tell people to give them to us and we'll responsibly take care of them, so it doesn't just go in the trash." Susan says some of her mittens will be available for sale at Wiscoy's on West Aaron Drive beginning Dec. 17. The family will also have a booth at the Bellefonte Victorian Christmas this coming weekend. Jeff calls his Mom the heart of the business. "She's not about making money. I gotta keep reminding her we gotta pay the bills," he says. "She does it to help people and that's really nice." It's time to gas up the snow blower and stock up on ice melt, bread and milk -- again. The official start of winter may be nine days away, but that hasn't stopped another winter storm from heading this way. The National Weather Service has issued a Winter Storm Watch for State College, Centre County and a broad swath of central Pennsylvania.